What does “going green” mean to you? For architects, developers, specifiers, manufacturers and end users, the definition of “sustainability” is constantly evolving as awareness continues to grow, and associated certifications and standard requirements change. But ultimately for today’s conscious consumers and manufacturers, sustainable design focuses on both a deeper philosophy and a transparent practice. It begins with manufacturers making a mindful choice to be resourceful in researching alternative processes and sustainable materials, while never compromising aesthetics. Likewise, it ends with educated consumers opting to reduce their own environmental and social impact by valuing and seeking out eco-friendly designs. This fall, Interiors + Sources magazine is celebrating innovative, sustainable design with its green-themed Curios Box. It’s a subscription-based sample box filled with the latest collections of sustainably-sourced interior design products from six manufacturers, and includes Hunter Douglas Architectural’s GreenScreen® Evolve™ roller shade fabric that’s actually derived from recycled water bottles. Through Interiors + Sources’ unique Curios box program, hundreds of architects and designers can learn about and experience the sustainable products firsthand. The boxes, whose contents remain a surprise until delivery, are mailed six times a year directly to subscribers at firms across the nation. But get in line, Curios already has a growing waitlist. Editor-in-chief Kadie Yale took to YouTube for a grand unveiling of September’s Green Box, which features a wide range of sustainable interior products from Hunter Douglas Architectural, Crossville Tile, Formica, MDC Wallcoverings, Prism by Arauco and Aspecta by Metroflor. Tucked into the box, Hunter Douglas’ Evolve™ roller shade fabric sample takes the form of a water droplet design, which Yale quips, “has honestly been the talk of our office.” The “super fun” droplet shape is a symbolic nod to the fabric’s origins – Evolve is made from recycled plastic bottles and is a zero waste product. A complementing overlaid leaf design evokes the overall goal of sustainability behind the 100%, non-PVC warp knit polyester shade fabric. The roller shade fabric is Cradle to Cradle Bronze and Greenguard Gold-Certified and contains a minimum of 78% Repreve® fibers made of 100% recycled post-industrial fiber and consumer plastic waste. 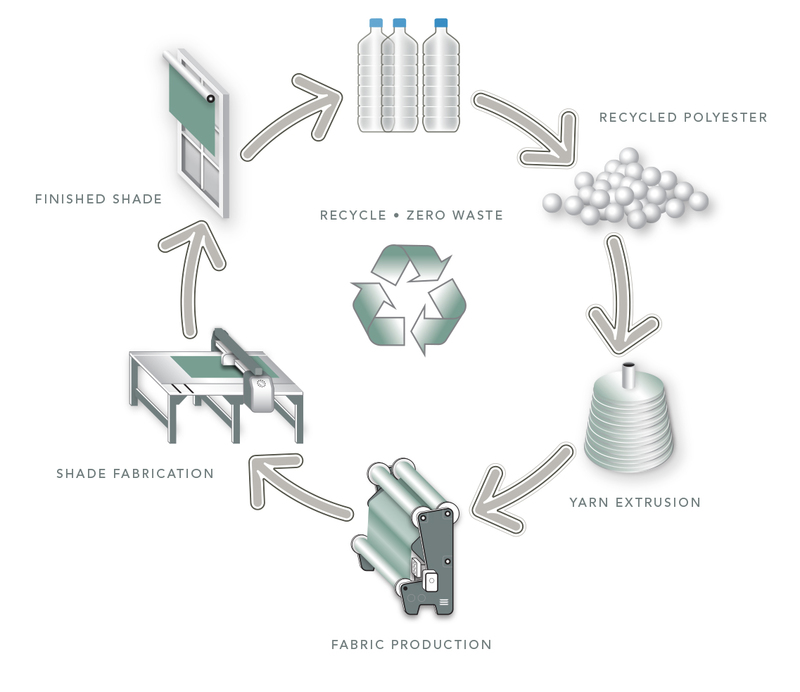 Compared to producing virgin polyester, Repreve reduces water consumption by nearly 50%, energy consumption by more than 6%, and greenhouse gas emissions by over 34%. According to BantheBottle.com, last year the average American used 167 disposable water bottles, yet only recycled 38 of those. Collectively, Americans consumed around 50 billion plastic water bottles last year but only recycled about 23% of these, wasting over 38 billion water bottles, worth more than $1 billion of plastic, in one year alone. With a variety of color and openness options to suit different commercial interior needs, GreenScreen Evolve reduces glare, reflects light, and with improved outward visibility, it offers great views to surrounding landscapes by using a unique diamond knit pattern. 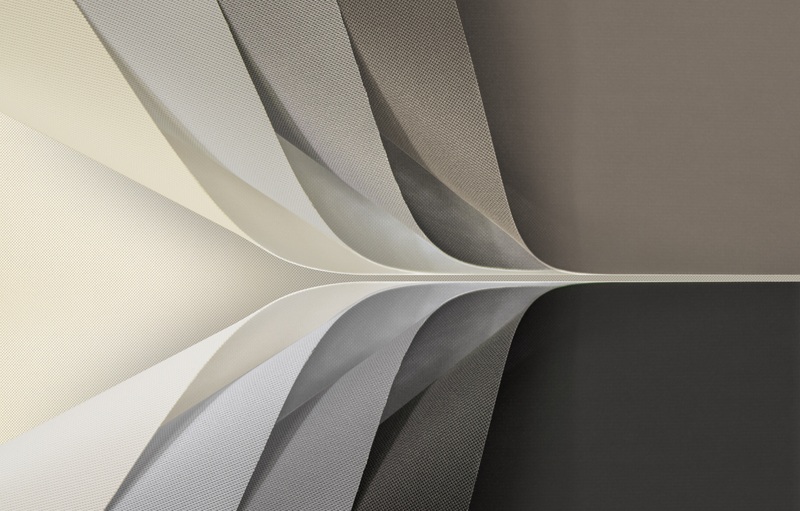 The flame-resistant window shade fabric equips architects and designers with the ability to control and filter natural light through high performance design that’s rooted in a greater story of sustainability. “The green Curios box is a smart way to introduce architects and designers to today’s most innovative, sustainably designed products that don’t compromise aesthetics. Now more than ever, manufacturers are focusing on the full lifecycle of the materials we use. The GreenScreen Evolve roller shade fabric made from recycled plastic bottles is a great example of using existing materials to create a unique, new design to help filter sunlight, while also reducing environmental waste,” says Nick Chiaro, Hunter Douglas’ sales manager. The production process behind Aspecta by Metroflor’s flooring sample focuses on social justice. At NeoCon the company announced it earned the first-ever JUST label given to a Chinese manufacturing factory, an acknowledgement of its fair practices and treatment of employees. To achieve this status, the facility was assessed on factors including safety, diversity, worker benefits and community engagement. Crossville Tile’s Retro Active 2.0 sustainable porcelain tile holds three Living Product Challenge certifications, from the International Living Future Institute. The non-toxic material’s color is saturated all the way through the product so that even if the tile chips, there won’t be an unwanted layer of white underneath. Meanwhile Prism by Arauco, a thermally fused laminate, brings a naturally antimicrobial finish and wood look to surfacing materials, an ideal option for particularly health-sensitive settings.